Students will need to be familiar with the concepts of area and perimeter. This activity will help consolidate understanding and overcome some common misconceptions such as the notion that perimeter and area are in some way related. Before the lesson, students work individually on an assessment task designed to reveal their current understanding and difficulties. You then review their work and create questions for students to answer in order to improve their solutions. In a whole-class introduction students critique examples of other students’ work, modeling the level of reasoning that is required in the main part of the lesson where students are grouped and given some mathematical statements. Using their own examples, counterexamples, and arguments students decide if the statements are true or false, creating posters showing their collaborative reasoning. In a whole-class discussion, students explain and compare the solution strategies they have used. In a follow-up lesson, students return to the original assessment task and improve their responses. 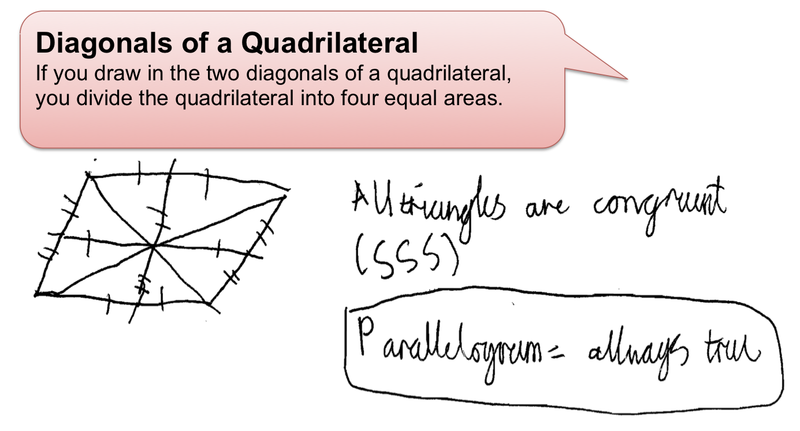 Each student will need two copies of Shape Statements, some plain paper, and a copy of Student Work: Diagonals of a Quadrilateral. Each pair of students will need Card Set A: Always, Sometimes, or Never True? (cut up into cards), a large sheet of paper, and a glue stick. 15 minutes before the lesson, a 100-minute lesson (or two 50-minute lessons) and 10 minutes in a follow-up lesson. Timings are approximate. Exact timings will depend on the needs of the class.